Dr. Anique Olivier-Mason is a technical instructor in Professor Cathy Drennan’s HHMI Education Laboratory at MIT. Together with Dr. Beth Vogel Taylor, Dr. Olivier-Mason works on initiatives on “Improving Chemistry Teaching and Mentoring Nationwide.” During her group meeting, titled “TA Bootcamp: Preparing graduate students to teach to a diverse student body and get the most out of their teaching experience”, Dr. Olivier-Mason discussed her work on the development of graduate student teaching assistant (TA) training programs at MIT and Brandeis University. Dr. Olivier-Mason started her group meeting by introducing the main learning goal of the TA bootcamp of preparing graduate students to become future teacher scholars. Feldon et al previously demonstrated that the inclusion of teaching experience within graduate school improves graduate students’ research1. As a result, the Drennan Education Laboratory has created and implemented TA training programs to help graduate students become more effective teachers by integrating the formal training program and also increasing graduate students’ confidence, community, enthusiasm and collaboration. The TA bootcamp program was first implemented in 2007 as a TA training program only for MIT’s Introductory Chemistry Course 5.011 TAs. This course is taught by Professor Drennan and Dr. Vogel Taylor, amongst other instructors in other years, and has 10 TAs. The bootcamp program extends over 5 days, totaling approximately 20 hours, in the week immediately preceding the graduate students’ first semester at MIT. The program was proven to be so effective that it was scaled up for all Chemistry Department TA’s in the 2010. Since 2010, the program trains all of the graduate students (approximately 35-50 each year) in the department and contains several different modules, including an introduction to MIT, a celebration of previous TA’s great teaching, an overview of course-specific TA responsibilities, and general preparation for their new roles as graduate student teaching assistants, amongst others. Each module is presented using educational best research practices and starts by first demonstrating the intended learning outcomes of the particular module to the TAs. As part of the TA bootcamp, previous year’s TAs attend several sessions in particular to share their teaching experiences and expertise with the new graduate student TAs. The previous year’s TAs not only share course-specific details, but also particular challenges that they themselves encountered while teaching. To aid previous year’s TAs in leading discussions on the course-specific details and experiences, the TA bootcamp has found it necessary to incorporate training sessions on leading discussions for the previous year’s TAs. Figure 1. 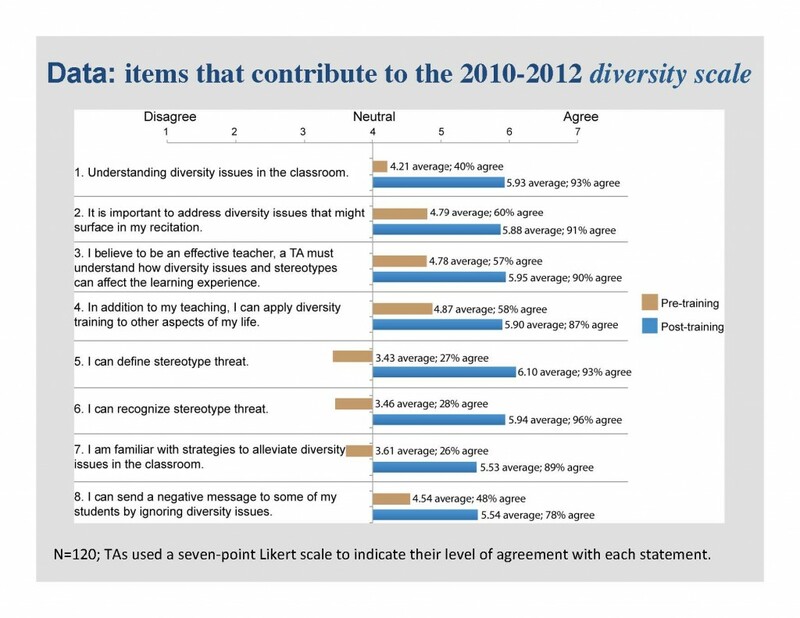 The teaching in a diverse classroom training module is effective at increasing the awareness of stereotype threat and preparing graduate student TAs for teaching in a diverse classroom. Another component of the TA bootcamp is a module on teaching in a diverse classroom or laboratory environment. This training enables graduate students to define stereotype threat, which is anxiety or concern based on a situation in which an individual potentially perceives negative stereotype2, and learn how to apply strategies to overcome stereotype threat in their own classrooms. The final module of the TA bootcamp for the Chemistry Department TAs is a microteaching session, in which graduate student TAs practice developing and delivering their own mini lesson plan. In the microteaching session, fellow graduate students play students during the lesson and provide wise criticism, in which the fellow students explicitly state their high expectations and belief in the presenter, to the presenter at the end of the lesson. While the microteaching sessions are often a source of great concern and anxiety for the new graduate student TA’s, they end up being very enjoyable for the TAs (score of 6.3 on a 7-point Likert scale). In addition to the Chemistry Department TA Bootcamp, the Drennan Education Laboratory has now implemented a modified bootcamp program in MIT’s Biology Department for all biology graduate students starting in 2011, and at Brandeis University for the BioLab TAs starting in 2012. In MIT’s Biology Department, the TA bootcamp is used to train second and fourth year graduate students prior to their TA responsibilities. The Biology Department TA bootcamp is a condensed version of the Chemistry Department’s TA bootcamp program and is 5 hours in duration. The bootcamp includes an advanced introduction to MIT, introduction to course-specific TA responsibilities and general preparation for their roles as graduate student teaching assistants. Dr. Olivier-Mason implemented the TA bootcamp program at Brandeis University for second year graduate students and undergraduate teaching assistants teaching the biology laboratory (BioLab) course. The Brandeis BioLab TA bootcamp is 3 hours in duration and includes an advanced introduction to Brandeis University, course-specific responsibilities, and general preparation for their roles as teaching assistants. Figure 2. In surveys on TA performance, the undergraduate students report that their graduate student TAs were well-prepared and effective teachers. Mean scores of more than 650 students are presented on a 7-point Likert scale. In surveys of the graduate students following the TA bootcamp program, the graduate student TAs reflected upon the usefulness of the program in preparing themselves for their course responsibilities. The data demonstrate the effectiveness of sessions with prior year’s TAs in preparing them for their teaching roles (‘discussions with former TAs on “challenges”’ ranked 6.0 on a 7-point Likert scale). In addition, the module on stereotype threat and teaching in a diverse classroom is also effective at preparing teaching assistants for negating possible stereotype threats in their own classrooms (Figure 1). The bootcamp has also proven effective with the most important critics of all: the undergraduate students the TAs are teaching! 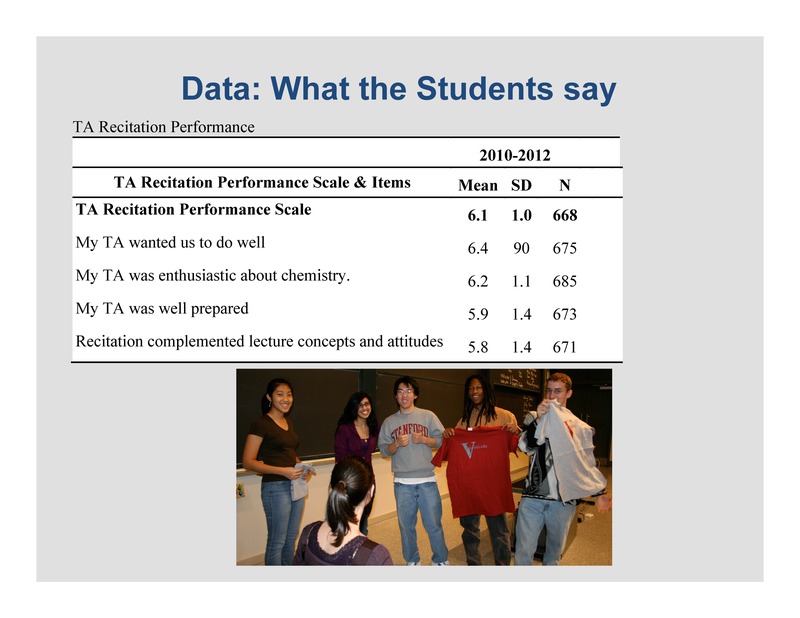 In surveys, undergraduate students in MIT Chemistry course 5.011 reported that their TAs wanted them to perform well in chemistry, were enthusiastic about chemistry concepts, and were well-prepared (Figure 2). The successful implementation of various modules of the bootcamp program in different combinations in MIT’s Biology Department and Brandeis’ BioLab course demonstrates that the modular nature of the bootcamp program can be easily used and adapted to suit many different applications of a TA training program. At the end of her group meeting, Dr. Olivier-Mason provided tips to implement a similar TA training bootcamp in another department or institution. The two most instrumental things in implementing a successful TA bootcamp program are to have strong departmental support and to utilize prior year’s TAs to provide their own experiences. When recruiting prior year’s TAs, Dr. Olivier-Mason reminded us to use personalized invitations and to provide advanced training session in which expectations and advice on facilitating discussions are clearly communicated. For more information on the TA training program, please see the Drennan Education Laboratory website. For more information regarding sample TA training program schedules, please contact Dr. Olivier-Mason at aniqueom <at> mit <dot> edu. In addition to her work on the TA training program, Dr. Olivier-Mason develops high school teaching materials for two successful initiatives. The two initiatives are: 1) a series of short videos featuring scientists from all academic levels discussing how they use basic chemical principles in their research with a focus on practical application and 2) a series of biology and medicine related examples for general chemistry lecture. Both initiatives take minimal class time and are designed to supplement fundamental chemistry and biology concepts. 1 Feldon, D.F., Peugh, J., Timmerman, B.E., Maher, M.A., Hurst, M., Strickland, D., Gilmore, J.A., Stiegelmeyer, C. (2011) Graduate Students’ Teaching Experiences Improve Their Methodological Research Skills. Science 333(1037-1039). 2 Kleck, R.E. & Strenta, A. (1980) Perceptions of the impact of negatively valued physical characteristics on social interaction. Journal of Personality and Social Psychology. 39(5): 861-873.